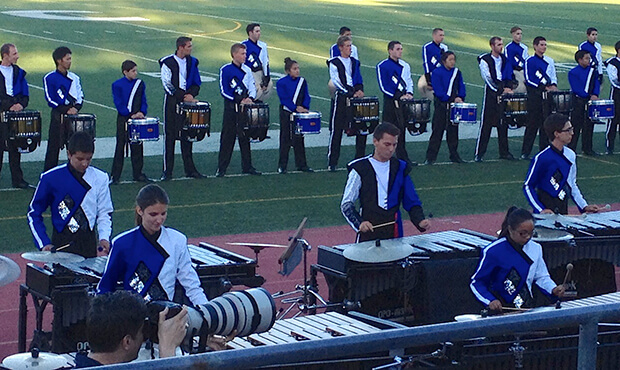 The combined drum lines of the Blue Devils A, B and C corps get ready to perform. 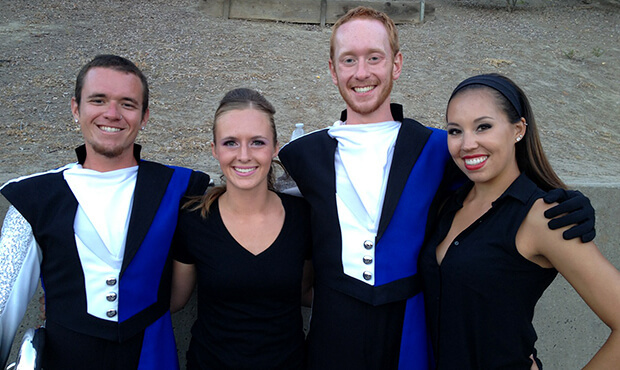 The Blue Devils are now on the road to begin their 2014 summer tour, but it truly began in Concord, California this past weekend with the organization's annual Family Day preview performance. "It's one of our favorite shows of the year," admitted Blue Devils Executive Director David Gibbs. On Saturday, June 14 at Diablo Valley College, four trumpet players gave a harmonic and uplifting performance of the Star Spangled Banner, followed by Gibbs' welcome and the procession of the corps which includes the Blue Devils and the Open Class Blue Devils B and Blue Devils C ensembles.. Special guests that night were members of the Jim Ott Brass Ensemble (JOBE), a collection of all-age brass alumni from local corps. Former Blue Devils drum major Dave Dugan conducted the ensemble through several familiar pieces arranged by the late DCI Hall of Fame member Jim Ott, including "Georgia," "Russian Sailors Dance" and "Legend of the One-Eyed Sailor." Under the guidance of Percussion Caption Head Scott Johnson, the combined percussion lines entered the field while the front ensemble entertained the audience. The "C" corps center snare drummer lead the massive line in warm-up exercises, beginning with the recognizable "8 on a Hand" and concluding with "Wipe Out", the "C" corps' drum feature. Next, close to 170 horns squeezed into an arc to perform the Blue Devils' well-known "Space Chords" conducted by Brass Caption Head John Meehan. The massive horn line finished with the "C" corps' "Surfin' USA," another tune from the group's 2014 production. Not on the scheduled program, but certainly a highlight of the evening, the "A" corps capped off the brass performance with its signature piece, "When a Man Loves a Woman." While the "C" corps set up for its production, four Blue Devils members received scholarships based on letters of recommendation, impressive transcripts and their answers to a questionnaire. The winners were: Marcus Stone, 21, a third-year euphonium "A" corps member; Paige Arcieri, 18, a fourth-year "B" corps color guard member; Greg Horner, 21, a third-year trumpet soloist from the "A" corps; and Emily Nunn, 21, a fourth-year color guard member with the "A" corps. Blue Devils scholarship recipients (from left): Marcus Stone, Paige Arcieri, Greg Horner, Emily Nunn. The youngest component of the Blue Devils organization, Blue Devils C, performed "Surfin' BDC," a production full of age-appropriate, yet highly entertaining, summer songs such as "School's Out," "Surfin' USA," "Wipe-Out," and "Fun, Fun, Fun." Up next, last year's Open Class silver medalists, Blue Devils B, fielded their largest corps ever at 150 members. Their show, "Noir [nuvo]," is based on the golden age of film noir and features music including "Young and Beautiful," "Brute Force," and "Children's Hour of Dreams" which was originally heard in the 1996 Blue Devils "A" corps' production of "Club Blue: A Gangster Chronicle." This year the World Class Blue Devils also brought the magic of movies to the field with "Felliniesque," an entertaining romp both musically and visually. Many of their white props are immediately familiar, token touches from the past including chairs from 2009's "1930" and coat racks from 2012's "Cabaret Voltaire." However, they also introduce some new props in the form of spotlight cameras, ladders, and table platforms. The platforms are used in staging the performers on multiple heights including the full tuba section and snare line. The production is a myriad of tunes: "Old Toys" and "Movie Studio" from Danny Elfman's Iris, "La Strada Theme," "The Clowns," "Circo Compagnia," and "Be Italian" from Maury Yeston's "Nine," a robust number featuring the color guard members playing tambourines. "Family Night is one of the most special shows of the year. We get to hang out with all the Blue Devils performers: young, old and too old," Gibbs laughed, "But it's actually very special for the young kids. For the C corps, it's their Super Bowl. It's great!" All three Blue Devils corps will make their competitive debuts on Friday, June 20 in Clovis, Calif., followed by a performance at Stanford Stadium on Saturday, June 21.